I love orchids. I think they are absolutely beautiful! In fact, I have decided that they look so nice that I have started buying a phalenopsis in flower to keep on our mantel. The last orchid that I bought lasted seven weeks, so how can I complain? Now, when these plants finish flowering, I “replant” them outsides. Central Florida is just warm enough that these will do just fine outside with a little bit of protection from a small tree or shrub. The fact that orchids need shade serves two benefits: it keeps the plants from getting too dry and it also means that whatever is providing that shade will also serve the purpose of keeping light frosts off of your orchid. So now that your orchid is done flowering– let’s plant it outside! (Side note: this is also a great place for all of those 50% off orchids that are constantly at garden centers. I recommend using fishing line because while it is very strong, it is not visible once you have tied your orchid to the tree. In Florida it tends to last about two years before the sun and heat wear it away and it falls apart. This is perfect because your orchid will be firmly attached by its own roots at this point and will not need the fishing line to constrain new growth. First step: Begin by thoroughly soaking your orchid in the original pot. Once the water has drained, hold on to the plant firmly and pull it out of the pot. If it is in pine bark you will want to try to shake some of the loose bark away from the roots of the plant. If yours is growing in moss then you are okay leaving that in tact. Second: Soak your sphagnum moss in water. It needs to be dripping wet before you add it to your orchid. Once it is soaked, take two small handfuls and sandwich your orchid between the two. Use your fishing line to tie this moss on the plant, circling many times until it feels firm against the roots and you don’t have to worry about it falling away. Third step: At this point you can tie a knot in your fishing line so that it is separate from the spool of fishing line or you can keep it attached, whichever feels most comfortable to you. I recommend finding a crotch in two branches as the place to plant your orchid. This tends to look more natural than if you just put it in the center of a smooth branch. 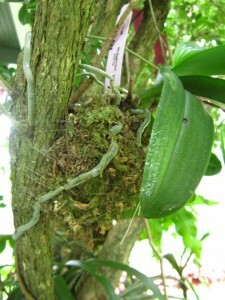 To attach, simply wind the fishing line around the branches and your orchid plant until the orchid will not move at all. This is important– your orchid needs to be tight to the branch! Care: Ahhh, my favorite part. Orchids are naturally epiphytic so they don’t need anything! You can water occasionally during dry periods, but this is up to you. I have found that plants will flower again more quickly if they are periodically watered with a soluble fertilizer like MiracleGro. To water your plants simply use a hose or watering can to send a stream of water over the sphagnum moss. You will know that it is absorbing when the moss turns from a light tan-gray to a darker brown. These are some phalenopsis that have been in our Lakeview Jasmine tree for one year. 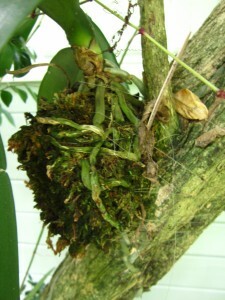 As you can see here the roots are now out of the sphagnum and have attached the orchid to the tree. I am sure the fishing line is still there but I can’t see it at all. 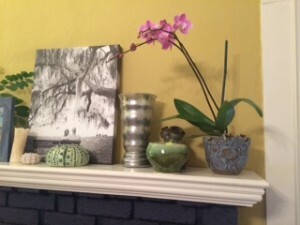 What a great excuse to buy orchids for your home! Yes! 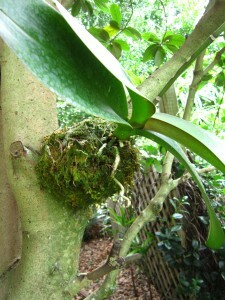 The pockets created by old palm fronds along the trunk are a great place to plant orchids!